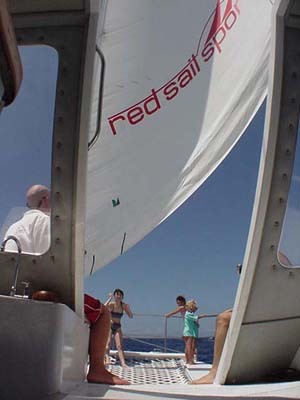 We did the Red Sail trip in September of 2000. It is only 40 minutes door-to-door from the Ranch to the Hilton where you meet. 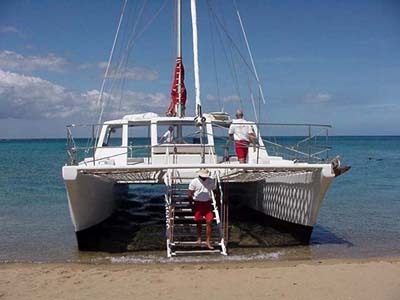 The sleek catamaran, clean, modern and stable, holds 49 but had only 13 for our trip. Weather was perfect - sunny and a nice breeze. The crew of three was courteous, friendly and gave us special attention, including swimming with us to show us a White Tip shark. We had a continental breakfast and a buffet lunch - muffins, croissants, juice, plenty of tropical fruits, cold cuts & veggies, drinks and cookies etc. There was mre than enough to eat and it was done well. The sails were up on the way back. The trip is 5 hours in the summer and 4 in the winter. I am not sure if they do lunch in the winter. The Waikaloa coast is much more scenic than the Kona coast although Kona has more fish. The lava tubes and canyons and sand made for a pretty back drop - not found in Kona. 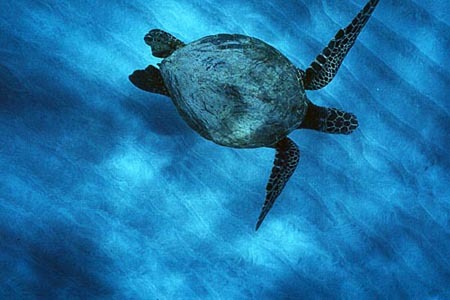 We saw the shark, a turtle, an octopus and lots of fish including the state Humuhumunukunukuapuaa. (reef triggerfish). We already plan to do it again. This area of the coast can get quite windy and choppy. 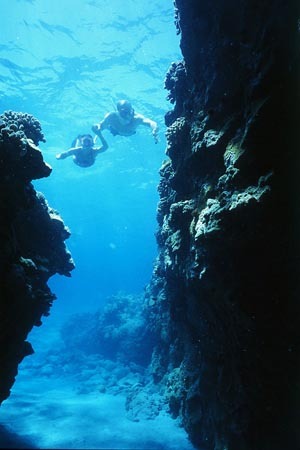 If you are a beginner swimmer/snorkeler, you might want to consider the Fair Wind cruise. For more information, see Red Sail's own web site at Red Sail Sports.